Recently, for personal and professional reasons, I’ve been thinking a lot about the concept of casting: a pre-production process for selecting a certain type of person. Keeping an eye out on what surrounds us, obsessively searching for a specific kind of girl or boy, the tendency to organize thoughts by lists and groups, having to decide who should be invited to the beach house or arranging tables: this kind of activities improves our skills and increases our greed in the culture of choosing. Last spring, I visited GALLERIA CONTINUA / Les Moulins a number of times. It is an abandoned factory lost in the countryside around Paris which welcomes contemporary artists, collectors and visitors. The kind of contemporary casting that’s most fascinating to me. During these Sunday trips, I have discovered the aesthetic universe of Hans Op de Beeck, and it felt like being chosen for a fashion show or landing the role of the protagonist in a Hollywood movie. Far from taking actual responsibilities or accepting director honours, I fell into the monochromatic universe of Kids, cabinets, pictures and ponds and I felt like a baby, a poet, Miss World, a peacock, rich, beautiful and dead at the same time. A true epiphany of senses. I walked – almost immediately as if I was on the runway – among gravel and small carved ponds: a garden of senses, just like the ideal magical garden in our imagination. 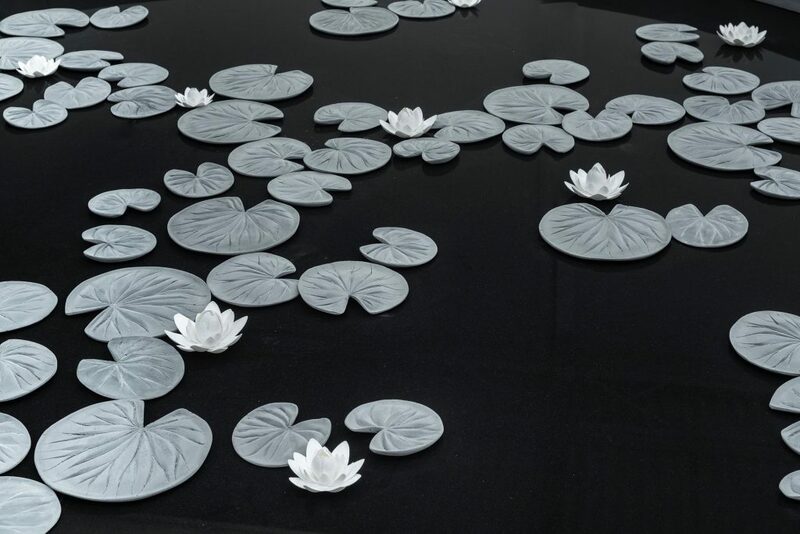 The more you observe and contemplate his work, the more evident it becomes that it is through his deep understanding of human nature that Hans Op de Beeck has managed to create a scenery which resembles our very own minds and memories. 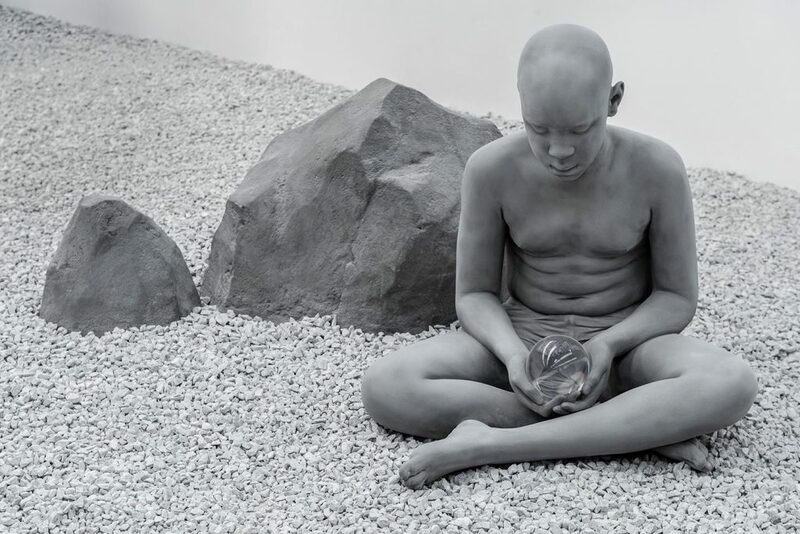 But you’re not alone in Hans Op de Beeck’s world. The installation is peopled by statues of young, silent humans, blind and indifferent to our passage. Watching them, I thought about casting again, this time more directly: a boy is holding a crystal ball in his hands, another one is about to shoot an arrow with a toy bow, a girl is listening to music with headphones, others are deep in thought. But there’s no music and it’s not a fashion show rehearsal… even if for a moment I thought it was, due to the beauty of those sleeping bodies. 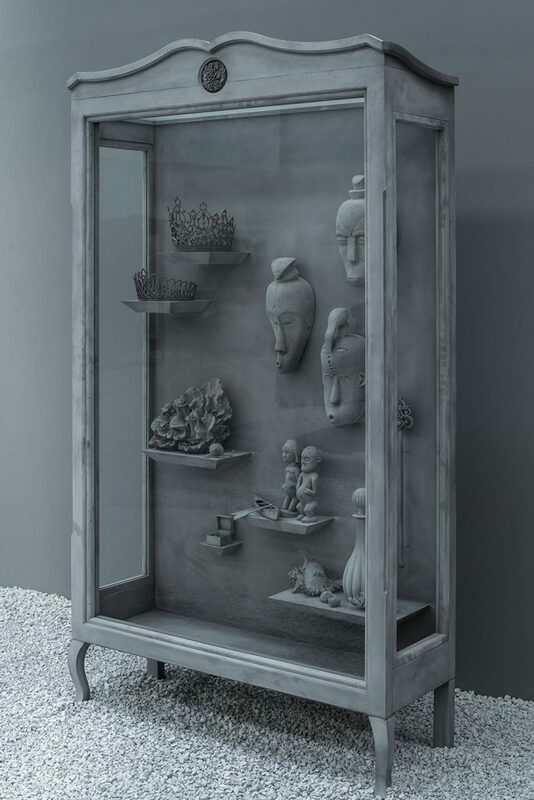 Moreover, some grey cases filled with wonders and a variety of souvenirs are also displayed – a tribute to cabinets of curiosities, the Wunderkammer. An apotheosis of pathetic, of Kamp, of quotations, of pieces of life, of parts of songs, of jars and tickets, of jewels… that leaves you paralyzed, thinking of your own life while sitting on elegant grey sofas, as uncomfortable as perfect. Profoundly superficial, Kids, cabinets, pictures and ponds is a visual moment which speaks bluntly to fashion lovers, with wonder, silence and introspection. Hans Op de Beeck proves to be a perfect casting director because he can handle our culture of imagining and conceiving, granting us the privilege of choosing what to imagine: who the characters in his perfect world are, what they are thinking and doing, what really is inside those cases. An unauthorized biography of our personal taste. I have photographed, walked and observed my own biography; I sat on it a number of times. I brought my mother there, to have her understand my world better (maybe she did not get it entirely, but she did have fun). Carelessly, while thinking of other stuff, I have been talking about Hans Op de Beeck’s characters with Giusy Ragosa, the director of GALLERIA CONTINUA / Les Moulins, while walking through this grey world, a total living matching our outfits. Giusy told me the artist often draws inspiration from his teenage kids. A real-life casting, the crystallization of which provides everyone with a chance of gazing and beholding. The artist’s obsession for vanity and the ephemeral recalls fashion, but at the same time this kind of “homemade casting” is a perfect fit for the homey and casual atmosphere of Galleria Continua. However, Kids, cabinets, pictures and ponds only manages to fool us for a second. We are not on the cover of a grey and glossy magazine, but rather inside one of the most successful experiments of Galleria Continua, a true platform for meetings between voices of contemporary art. Therefore, we can only wait for the next Vernissage at Les Moulins, on October 14. For those who may not know about it, it’s one of the coolest events in Paris: an outdoor Sunday, a trip/happening which turns out to be a can’t-miss event every season, following the best vernissage tradition. A meeting of personal style and widespread aesthetics. The perfect occasion for a casting of your own, for emotional purposes only.